Mark Twain said that cats are unique in the animal kingdom in that they will never submit to any authority but their own. There’s a lot of truth to that. Cats live with us at their pleasure, not through the pack bonds that dogs have. Picking a cat to adopt is very tricky. How can you tell if the cat you’re interested in will fit into your home and lifestyle? 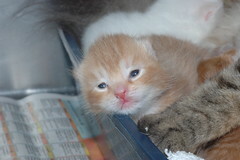 It gets even harder with kittens, who haven’t really developed all of their personality yet. That’s the first thing to realize when you’re looking at cats. Each one has a personality that may change or develop over time. 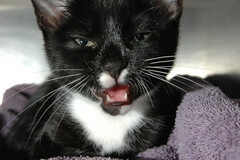 Cats do have some personality archetypes that you can use to pick the right cat for you. I’ve found that cats have some combination of two traits that play into adoption. There are cats that associate strongly with the place they live in, and there are cats that associate strongly with the people they live with. Place cats tend to shy away from human contact. In a family setting, they may bond very strongly to one person at the expense of everyone else. My cat is a strong place cat. She doesn’t like to be picked up, and only accepts affection on her terms. She seeks attention when I can’t move around much. In bed, in the bathroom, or sitting down. Even then, it’s just barely at arm’s reach. I’ve never done anything to intimidate or threaten her, but she remains aloof and distant. She was a 5 month old feral stray when I adopted her. She never had the human socialization as a kitten that would imprint humans as family or comrades. She’s learning. I like to say that she’s still getting used to me, 15 years after I adopted her. Twitch is definitely on the Place side of the cat spectrum. She still associates with me as a human (maybe a big, ugly, not so smart cat?) and a companion to some degree. She misses me terribly when I go out of the house, she just doesn’t show it in an affectionate way. Her territoriality has made it impossible for me to adopt another cat, too. She’s never gotten along with any of the cats I’ve fostered, either fighting or hiding until the trespasser leaves. 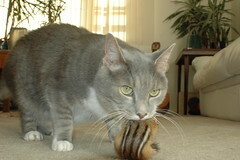 The distinction between a Place cat and a People cat isn’t meant to help you avoid one in favor of the other. All cats have some combination of both traits. It’s up to the adopter to examine their lifestyle and decide what combination works best. 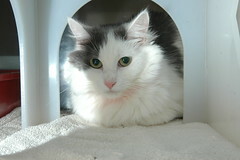 An adopter who spends a lot of time away from home may want to weight their choice towards a Place cat. That way, the cat has a foundation that they can rely on when you’re not at home. A large family will want a more outgoing cat that can deal with the constant attention they’re sure to get. Once you’ve marked a spot between Place and People cats, you can move on to refining the personality that’s right for you. Many animal shelters have started to use personality cards to describe their cats. The cards are based on the adoptability evaluation that each cat gets when they enter the shelter. The cards give you a more fine grained idea of how your cat will act after you adopt him/her. The adoring fan, the CEO, the Head Coach, etc. 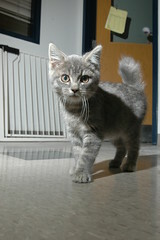 After deciding the general personality traits you’re looking for, you’re ready to start meeting cats at the shelter. This is the hardest part of the adoption process, harder than the introspection you just did. Cats have moods, just like people. You may meet the perfect cat who’s having a bad day, or the wrong cat who’s having a rare mood. Here are some things to keep in mind while you’re meeting cats. 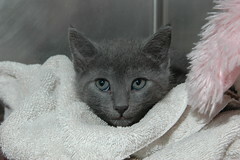 Set aside several weeks to visit the shelter. Don’t assume that you will find the perfect cat on your first visit. Also, don’t worry that you’ll miss the perfect cat if you don’t adopt one this week. 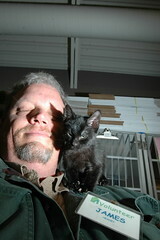 In the 7 years I volunteered at the shelter, I met at least 1 cat each week that I could adopt. Not just a suitable adoption, either, a really good adoption. When you first start looking at cats, they all seem the same. It takes time to develop a feeling for the subtle differences between cats. It also takes time to develop a personal sense of which cats you like and which ones you don’t. A cat may do something incredibly cute on your first visit, then come home and live in your basement like an ogre. 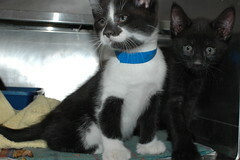 You may also think that a people cat is right for you, only to change your mind after meeting several. Don’t adopt a cat for purely emotional reasons. Cats don’t have the fine grained personalities that humans do. The perfect cat for you is really a small range of cats. 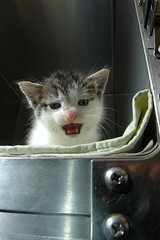 It sounds detached, but you should evaluate each cat that you meet, just as the shelter does. Otherwise, you may wind up taking the cat back to the shelter, which is traumatic for you and the cat. Using more reason when you choose a cat will lead to better emotional bonds later on. Don’t adopt a cat with the expectation that it will make you feel better or fill a gap in your life. Be honest about this, there’s no one to criticize you for evaluating your own feelings. If you rely on your new cat for emotional support, you will inevitably be disappointed. Not because they’re mean… they’re cats. You’re adopting a new companion with its own emotions, failings, and ambitions. Cats share our space with us, they don’t fill that space. 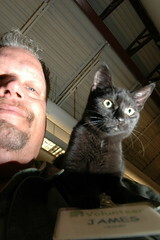 This picture looks scary, but this was one of the friendliest People cats I ever met at the shelter. Reaching for me with his paws and vocalizing is a sign of intense interest. 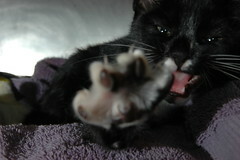 Pawing is an intimate gesture among cats, usually between a kitten and its mother. 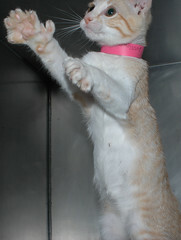 I pictured this cat stretching, so it looks like he’s swatting at me. This cat’s hunched back tells me that he’s cautious towards me. His forward facing ears tell me that he’s curious about me. Sniffing my finger is a sign of interest. We wound up playing for 15 minutes. This was a very friendly People cat who gnawed on my camera strap as much as purred in my ear. Don’t try to anthropomorphize a cat’s emotions. 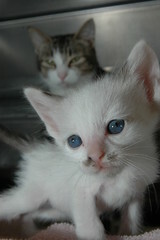 Cats have emotions, and they give physical queues to show you what those emotions are, but they aren’t human emotions. They also don’t use human expressions. Cats don’t “smile” or “frown”. 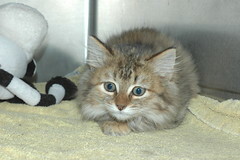 A nervous cat will change the perk of its ears or stand a little stiffer than a calm cat, not make a facial expression. It takes time to get used to the unique body language that cats use to communicate their mood to other beings. Try to get a private room to meet cats. 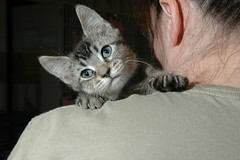 Most shelters provide small meet and greet rooms. It’s hard to meet a cat that has a lot of distractions competing for its attention. A room with a desk or a bench is a good place because you want to see what kind of hiding instinct the cat has. Don’t worry if s/he bolts into the tightest corner of the room at first, s/he may just be stressed out by the moment. 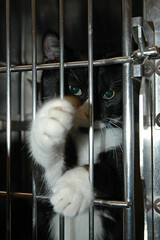 Ask the shelter staff for the cat’s cage card. This is the sheet of paper for each cat describing daily appetite, mood and medications. 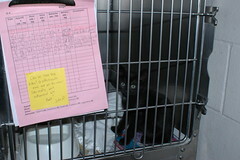 Volunteers occasionally put notes on the cage cards that can tell you more about the cat’s interactions with the staff. If you get a card with a lot of hearts and “Super cat!” all over it, that’s a people cat. 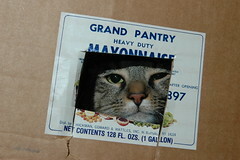 It takes a really gregarious cat to warrant a comment on the cage card. Cats also have papers filled out by the person who gave the cat up for adoption. Many times, these are very favorable reviews that overlook any flaws. Who’s going to give a cat up for adoption, then write bad things on the admission form? It’s a good document to read, though, because you can find out all the positives in one place. 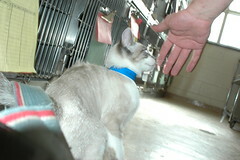 If the cat doesn’t have much information on the admission card, it’s most likely a stray. That’s not a bad thing, just another piece of information. Strays can be just as affectionate and loyal as a family cat. Don’t judge the people who gave the animal up for adoption. People give up animals for a million reasons. For most people, it was the only course of action they could take. For the others, at least they’re making an effort to give the pet a future. 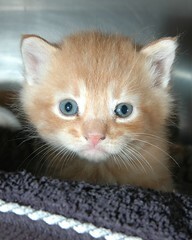 By the same token, don’t judge a cat as unwanted, just because someone gave it up for adoption. Talk to the volunteer or staff member who is helping you. They see the cats day in and day out. Most of them there can think of a really special cat, maybe one that’s waiting in the back for an adoption space to open up. Don’t ask for any special consideration, just try to use the intimate knowledge they have. Most shelters don’t allow you to put an animal on hold without some payment. Don’t ask them to change the policy. Once an animal has been adopted, it goes into a temporary limbo where it doesn’t get as much attention because it’s about to go home. Once you’ve decided to adopt a pet, it’s best to take it home the same day. Before you ask to meet a cat, watch it in its cage for a while. See how it reacts to the volunteers and people that pass by. This can tell you if the cat is tired and sleepy, or alert and active. You can also tell how outgoing a cat is by watching it in its cage. 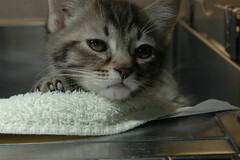 Kittens can get hyper stimulated and bounce all over the cages until they collapse into a nice nap. If you show up just before or after they fall asleep, don’t assume that they’re like that all the time. Is the shelter really crowded? Are there a lot of people or animals there? When a shelter gets very crowded, the animals tend to burrow or hide more than they do when the shelter is under capacity. A very gregarious cat may scoot under the greeting room bench if the shelter is packed to the rafters. Let the cat find its own way out from under the bench. You may wind up sitting there for a few minutes until s/he comes out to see who else is in the room. If you think about it from the cat’s perspective, it’s reasonable. 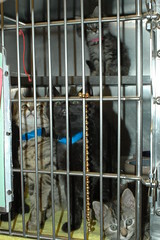 They can tell that the other cats around them are under stress, and they feel safe in their cage, under a blanket. Suddenly, someone takes them and puts them in a small room with strangers. The same principle applies if there are a lot of humans in the shelter. 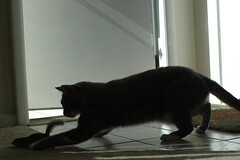 Weekdays, there is a steady, slow routine that the cats get used to. Saturday and Sunday, there are lots of people around, and they may wind up seeing several other groups before you. 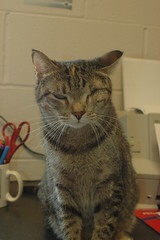 Once a cat has poked its head out into the greeting room, try not to advance on it to make contact. Cat’s have a personal space that they take very seriously. The edge of the space is about as far as they can reach their paw without shifting their weight, maybe 6 inches away from most cats. 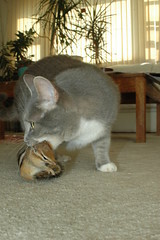 If you get too close too fast, even a friendly cat may give you a clawless swipe to keep your distance. Cats have a great sense of smell, even better than dogs. They’re going to meet you first with their nose. It doesn’t matter if you’ve been peeling onions all day… to a cat, you’re a specific human covered in onion smell. Let them get a good snootful and don’t try to pet them until they’ve had a chance to “look” you over. 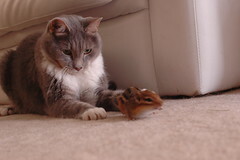 That first encounter determines a lot for a cat. In nature, animals decide very quickly, and with some finality, if they like a newcomer or not. Cats have been “domesticated”, so they’re not likely to see you as a threat, but they may decide right off the bat that you’re not their kind of human. If a cat avoids gentle outreach and contact, you may have just hit the wrong chord somewhere. 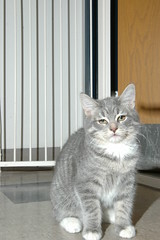 It’s best to meet a new cat rather than force a relationship with an unwilling feline (see the Mark Twain quote above). Some cats will go right into a chin rub and seek attention immediately. If you’re looking for a people cat, that’s a good first sign. It’s not conclusive, though. Twitch hid under a desk, then came out and wanted all kinds of attention. She surprised me when she became more aloof at home. Try to last through that first blush of contact without getting the cat too excited. You want to see what the cat is like in a calm state. That’s (hopefully) what they’ll be like when you get them home. A chin rub or a scratch is fine, just don’t escalate the cat’s mood with too much play. After you’ve met the cat, try to pick it up. Just put a hand under its belly and see if it shies away. Don’t be aggressive and don’t put your hand there with the intention of picking up the cat right away. You just want to know if the cat is utterly opposed to the prospect of being picked up. 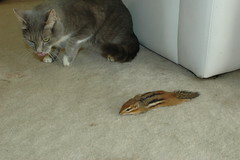 If the cat doesn’t mind, try gently picking it up. Support the cat when you pick it up. One hand under the ribcage and one under the belly is usually fine. Don’t pick a cat up by the scruff of the neck, that’s dominate behavior to an adult cat, and s/he won’t be as friendly after that tazer like effect goes away. Once you pick up a cat, let it settle into a comfortable position. Most cats like to have their feet beneath them and a sense of solidity underneath that. 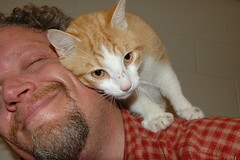 I’ve met a few that were true acrobats and perched on my shoulders, they were all People cats. A Place cat may shy away from being picked up, or jump down shortly after settling in. Once they’re past the initial excitement of meeting a new person, the two of you can see if you’re really compatible. There are no fast rules about evaluating a cat for adoption at this stage. Just spend some time together and let things happen as naturally as you can. 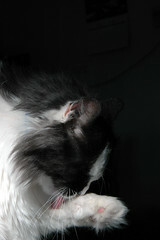 You’re evaluating the unspoken bond that makes cats such special pets. Do you like a bossy cat? Some people find it endearing that a creature so dependent on them for everything makes a big deal out of everything else. Do you like a timid cat? A noisy cat? That’s what you’re trying to find out in these meetings. 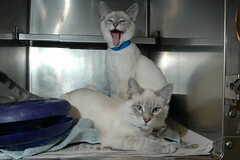 Don’t make any commitments until you’ve had a chance to experience a range of cat personalities. Meeting a cat in an adoption setting is a very personal thing. If you’ve brought the whole family, pay attention to the emotional cues that the cat is giving you as well as those it gives to the other people there. It’s easy to watch the cat interact with your kids and make a decision based on that, but that does you an injustice. A family pet should fit into the whole fabric of your family, not just one or two members. 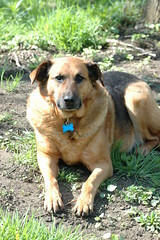 Some people like a pet that will strongly associate with a single family member, that’s a personal decision. Adopting a pet for the first time is a hazardous undertaking. You’re trying to evaluate a bond that you don’t know much about… not in an intuitive way, at least. The best thing you can do is remind yourself to suspend your cute factor until you have a better sense of what you want from a cat relationship. Get a good feel for what traits all cats share in common before you look for the specific ones that are perfect for you. The only way to do that is to meet a lot of cats before you make your decision. 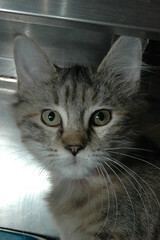 The hardest thing about cat adoption is saying “no” after meeting a really cute cat. It’s OK to pass on an adoption because you don’t feel like you know enough about your own needs to make an informed decision. Passing on a seemingly perfect cat is part of the process. You have to suspend the most instinctual part of your nature when you’re looking at cats. They tug at our hearts in such an effortless way that we’re befuddled before we know it. Sometimes, the best thing you can do is walk away from the perfect cat. It’s not like picking a human companion. There are other perfect cats out there waiting for you to recognize the internal connections that will make for your perfect pet. Picking a cat for adoption is about suppressing your emotional reactions, and relying on your own sense of your needs; But it relies on an emotional connection to make it right. It’s a very delicate balancing act that you don’t want to rush into. Take your time when you’re choosing a cat. You will have years to develop a unique relationship with your new pet, it makes sense to take a few weeks to be sure that you’ve made the right decision. I have about as much control when I hear of a sure thing fishing spot as Yukon Cornelius. 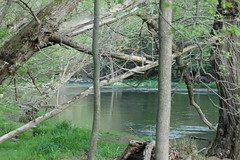 A guy at work told me about a stretch of Oatka creek that gets stocked with yearling and 2 year old trout every spring. So, My friend and I set out early one morning to check it out. We fished the stream for about 4 hours, didn’t catch a thing. Monday, I go back into the office, ready to confront the guy for sending me to a dead spot. His desktop image was 15 trout in a baking dish. He an two others caught their limit that same morning… and were heading back home after just an hour. Turns out, the good spot is a couple miles further upstream than the spot I tried. This afternoon, Amber and I went looking for that section of the stream. We found it pretty easily, even the gun club that my friend at work talked of. Three of them were drinking beers across the stream on the club’s porch when I got to the big pool. I tried a bunch of different lures, from spinners to spoons to jigs, but didn’t catch a thing. Oh well, it was a fun hike. I took my disappointment out on the dog, mocking her mercilessly for being afraid of a woodpecker. I’ve been volunteering at Lollypop Farm for several years. I take pictures for their adoption website. 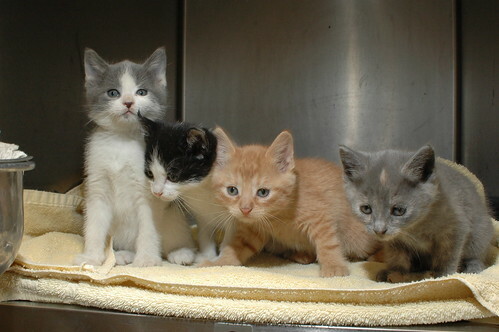 Here are some of the best kitten pictures from the shelter. 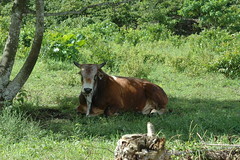 The Dominican has strict rules about the treatment of Brahma Bulls. They are only used for competition. 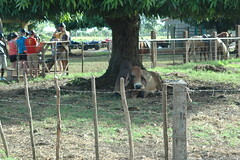 the country has recently outlawed selling them as labor after their competition days are done. A farmer with a prize winning bull can make a year’s worth of money in one weekend. That’s when I intervened. 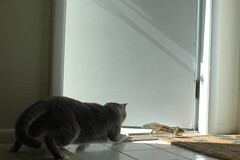 Try to catch a determined cat and take pictures while a chipmunk tries to figure out how to go through an open door. I’ve held my opinion to myself for the past few months. This week, Michael Vick, quarterback for the Atlanta Falcons, agreed to plead guilty for bankrolling a dogfighting ring in Virginia. Espn Link. I go to an animal shelter every weekend. I’ve probably seen more animal abuse than you ever will. I’ve seen the aftermath of dogfighting rings before. Every now and then, a group of fighting dogs will come to the shelter. They’re secluded in fenced off suites until the trials are over, then the dogs are temper tested. 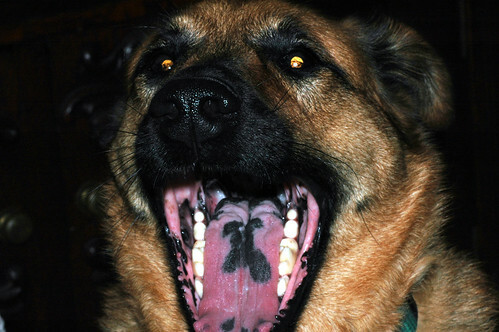 Most fighting dogs fail their temper tests and have to be euthanised. Despite the trauma of their lives, some animals still make wonderful pets. My dog was abused before I got her. It’s heartbreaking when the one eyed cat comes over and sits in my lap. We’ve formed our society around the principle that we can control our instincts. I know what it’s like to want to harm an animal. Believe me, after 5 months of failing to house train a 60 pound German Shepard, the urge to hurt an animal crossed my mind more than once. 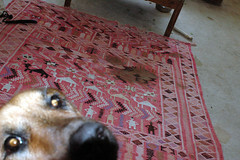 I swallowed a lot of anger over smelly poops in the living room. Indulging that momentary anger would have made me an animal abuser… a person who is unable to uphold the slimmest requirement of society: Don’t abuse the helpless. Now, three years later, I can still say I’ve never even yelled at my dog. The idea of electrocuting or strangling a dog is repulsive to me. I don’t want to condemn Michael Vick because he’s an NFL star, because he’s black, because he’s famous… I want to condemn Michael Vick because I see animal abusers, and the harm they do, almost every week. Two baby squirrels have moved into my neighborhood. 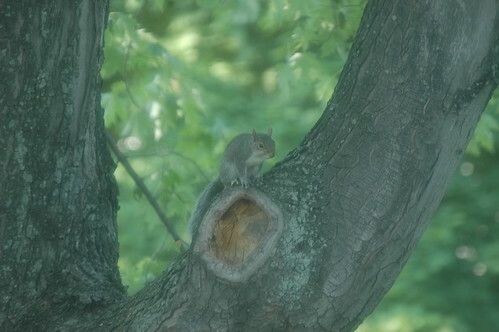 They live in the neighbor’s tree, but they play in my Sugar Maple. It’s nice to watch them chase each other around. There’s a vacancy in my Maple right now. 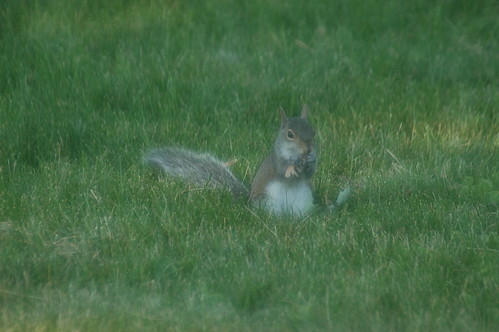 I hope they move in at the end of the summer.